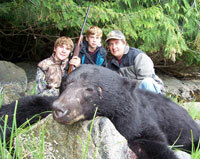 Black Bear Hunting with North Coast Adventures is a relaxed pace adventure suitable for hunters of all ages and abilities. Our hunt area offers abundant game and a 2 bear limit! 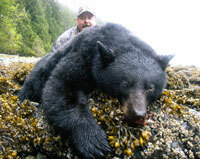 Our area also offers the ability to hunt for the SCI Island Bear as well as the North American Black Bear on the same trip. Both bears are present in color phase as well. These trips require average marksmanship with less than 100-yard shots being most common. 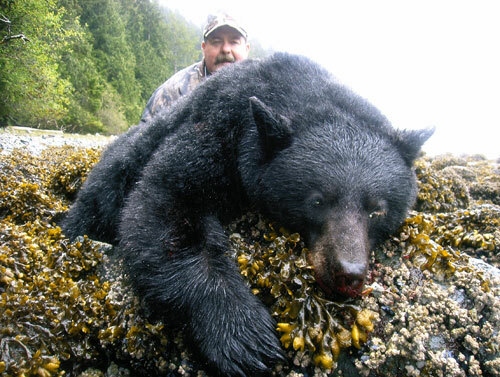 Glassing and stalking for short distances along beaches and grassy creek mouths during the afternoons is the most common method of hunting. Physical demands are low to average and typically suited to all hunters from young beginners to the physically challenged. Seasonal temperatures in the mid 50-degree F. range with daily occurrence of showers make rain-gear and waterproof boots, hat and gloves essential. Typical spring boars have excellent hides, average 300 pounds, and square 6 1/2 to 71/2 feet. Although 80% of these bears will be black, we do harvest chocolate and cinnamon phase animals in some areas. Skull sizes average 19" and several each year record over 20". 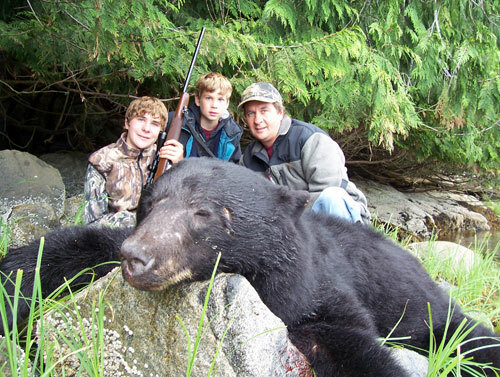 Black bear populations are high in our area with an excellent opportunity for hunters to harvest a "once in a lifetime" trophy. Recommended rifle - 300 Win Mag or larger with variable scope and 200 grain bullets. 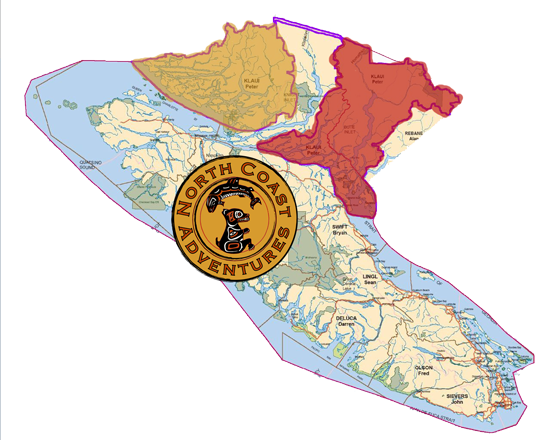 North Coast Adventures' exclusive outfitting area is comprised of over 7,000 hundred square miles of the Coast Range Mountains situated adjacent to Vancouver Island. This remote country is inaccessible from the interior of British Columbia by road, which virtually eliminates local hunting pressure. Using the combination of our 60 foot yacht, unsinkable skiffs and Suburbans that we barge in, we can access even the most remote of locations. No T.F for wolf which can be "baited and called electronically or with predator calls"
Hunts may include Salmon, Halibut, and Trout fishing. 5% Goods and Services Tax is applicable on all our hunt fees.